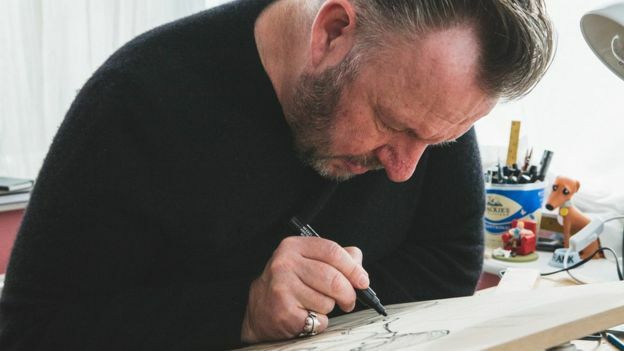 When Pete McKee gave away his artworks in exchange for food bank donations last month, the queue in his home city of Sheffield snaked around the block. When the donors handed over their tins of food, McKee handed them a tin of his own in return. It was empty, but it had a label he’d designed himself. 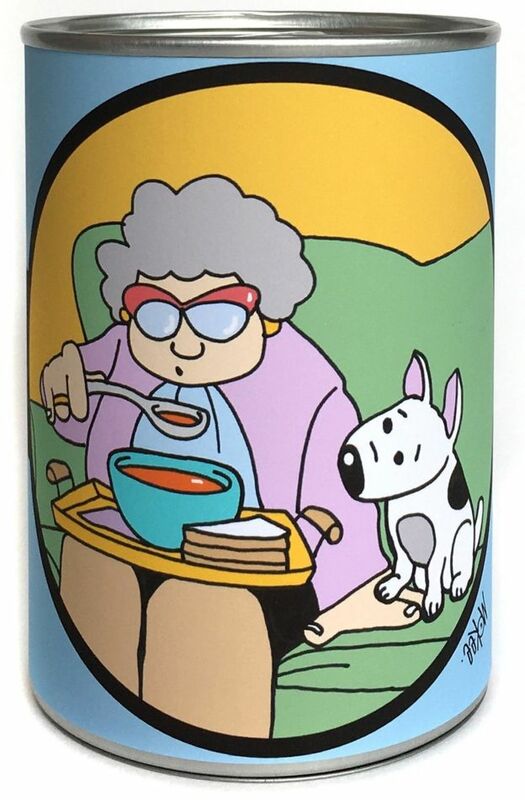 It was a nod to Andy Warhol’s famous Campbell’s soup tin, but McKee’s limited edition packaging had one of his trademark cartoon-style pictures – of an old lady supping a bowl of soup on a settee with a tray balanced on her lap, with a dog gazing longingly at her lunch. 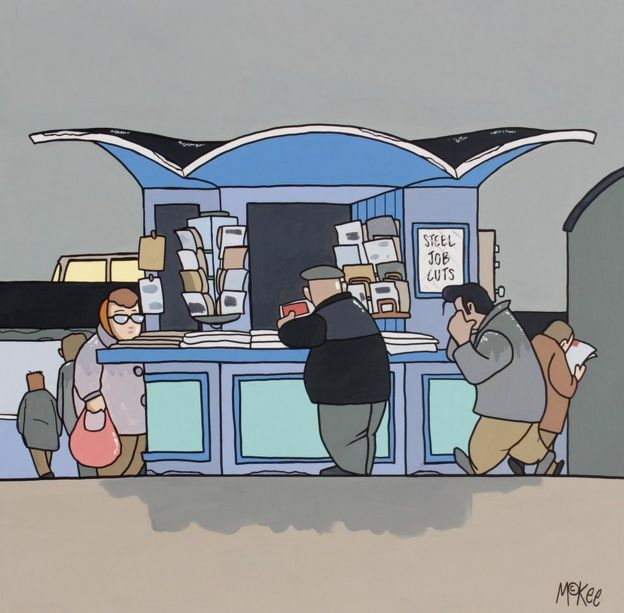 In a world where lots of successful artists seem removed from real life, McKee not only paints real life but has built up a big following among people who may not otherwise be into art. “I’m proud that the people who come to my shows are just basically normal people like me,” he says. He’s about to open his biggest exhibition yet, but it won’t be in an art gallery. “My first ever exhibition was in a pub and my second was in a bar and my third was in a restaurant,” he says. “I knew that’s where more people were who would understand my work. “I went to a proper gallery in Sheffield and they turned me down. They said, ‘People who come to my gallery wouldn’t get this.’ I thought, fair enough, then. Your loss. In 2014, a one-day exhibition of his work in an old factory attracted 3,000 people. Two years ago, 5,000 people visited a two-day show. The new exhibition, which opens on Saturday in a former spring factory, is on for 16 days. He says he wants his venues to be the “most welcoming place you could possibly go”, with music and bright surroundings and nostalgic knick-knacks, rather than white walls and an intimidating atmosphere. Titled This Class Works, he bills the new exhibition as a celebration of the working class. 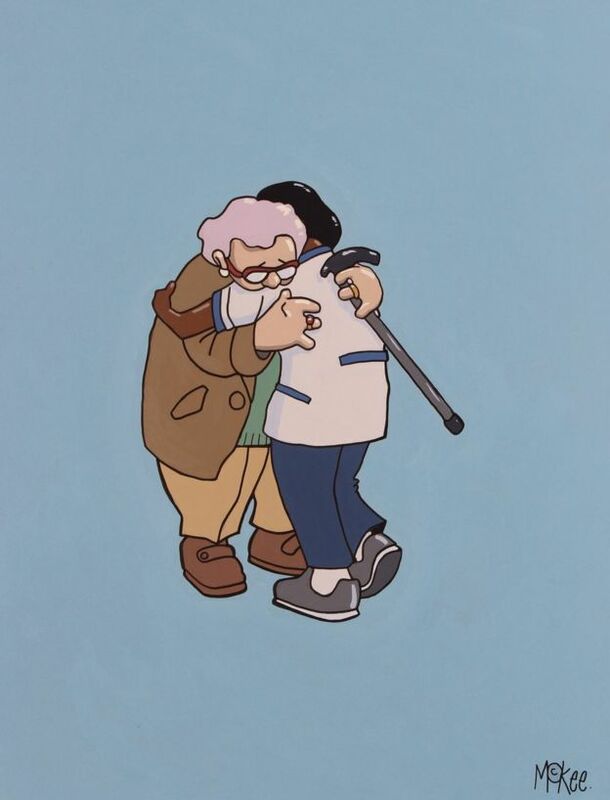 His paintings (all done with trade paint), show people that remind us of mums and dads and nans, all depicted with affection and humour and without moral judgement. 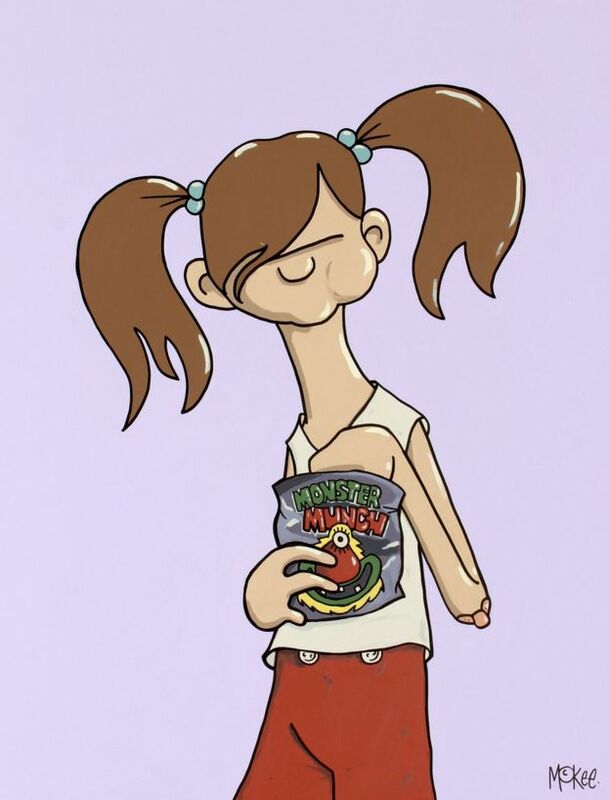 There’s a painting called National Hug Service, showing a grateful elderly patient in an embrace with a health worker; and one called Let Them Eat Crisps, depicting a girl munching on Monster Munch. There’s one of Tina, an imagined checkout worker, which the artist says refers to the fact “supermarket work is the new coalface of industry”; and one of a boy in a hand-me-down football kit, which is about how “the only thing that people want working class to be good at is sport”. The exhibition will also include contributions from others including actress Maxine Peake, Heaven 17 musician Martyn Ware, photographer Tish Murtha and artists Jo Peel and Sarah Jane Palmer. McKee came up with the idea for the exhibition after getting annoyed by how people who voted for Brexit were portrayed by politicians and the media. “The working class cities that were being starved of anything real and beneficial, kicked back, and said, ‘We’ve had enough’,” he says. People in positions of power “just lambasted the working class for voting for Brexit and called them idiots and didn’t understand the warning signs”, he says. “But these people have got nowt anyway, so they’ve got nowt to lose, really. Their lives aren’t going to change drastically. McKee, 52, grew up on a housing estate in Sheffield. “Our family existed on a budget and I got free school meals and I also got welfare clothing from the council, so I grew up in a level of poverty, but everyone around us grew up with a level of poverty,” he says. But there’s no point using his art to vent his frustrations about those who wield power, he says. “I don’t need to make statements that are going to make people angry. It’s not an emotion that’s useful to anybody. So it’s always better to deal with this subject with some humour,” he says. When you grow up with nothing, “there are only two ways you can deal with that”, he goes on. “You can either just laugh in the face of adversity, which my dad taught us to do as a family, or crumble. 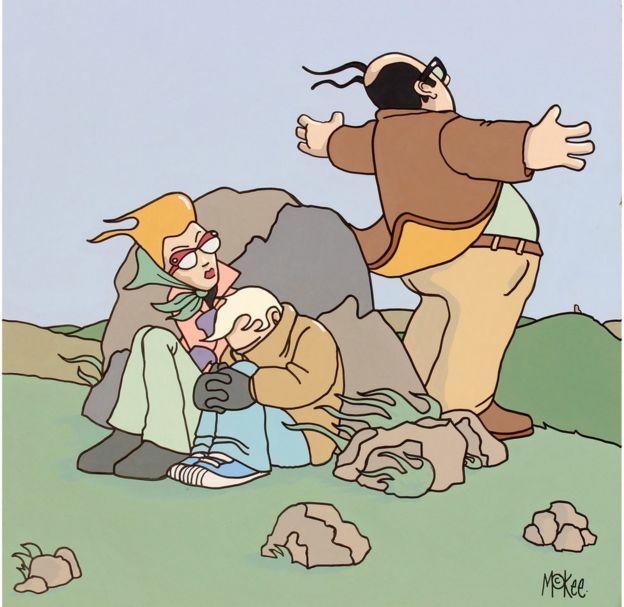 McKee is also known for his portraits of rock stars like Oasis and the Arctic Monkeys, and for his work for the Teenage Cancer Trust and designer Paul Smith. He doesn’t think many artists have achieved such self-made success without support from the art establishment. He was rejected from art college and says young working class artists have “absolutely no chance” of getting far unless they can go to a prestigious art school like St Martin’s. “I don’t think there are many other artists in this country doing what I do,” he says. “But I’m not known anywhere outside of my city and a few other cities who get the work. “If I lived in London and I went to St Martin’s and glittered a turd and put it on a stand, then I might get recognised.